East Mabon was one of the temples we visited on Day 2 of the Angkor tour. Though it's neither very large nor particularly elaborate, East Mabon stuck in my memory for two reasons. 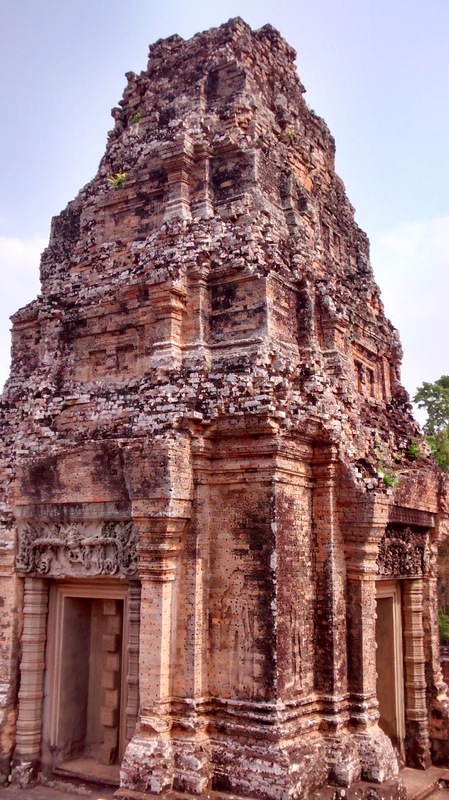 When it was built more than ten centuries ago, East Mabon stood in the middle of a large reservoir called the East Baray - a man-made reservoir that served Yasodharapura, the then-capital of the Angkor kings. 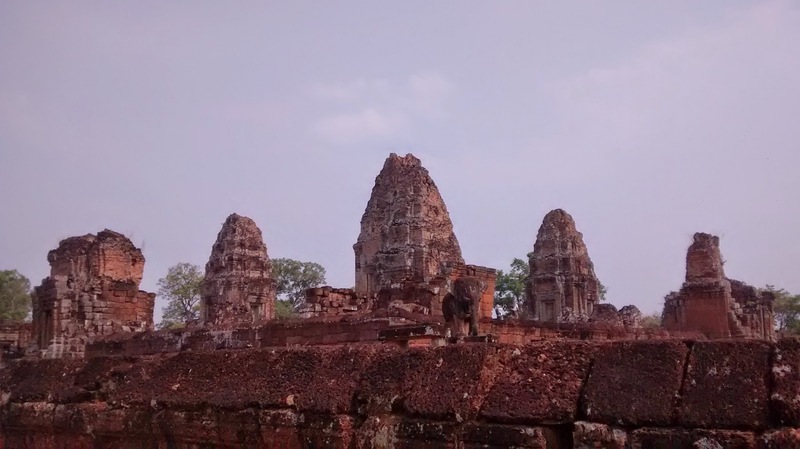 It could be approached only by boat, and so it had none of the usual trappings of the Angkor temples - the outer enclosures and the causeways and the naga-shaped balustrades. Instead, it had boat landings! I imagined the temple standing majestically in the middle of the reservoir, its towers reflected in the waters below, its laterite walls glowing red in the sunrise - and fell instantly in love. Of course, the reservoir has long since dried up. No trace of it remains except possibly the sandy soil around the temple (see above), and the fact that the temple's outer enclosure seems unusually high (because of course it had to be higher than the surrounding water). The second reason I liked the temple was its set of elephant guardians. While pairs of lions guard the entrances of East Mabon, elephants stand at the corners of each of the two enclosures. And such cute elephants they are! This was the only temple (I think) where we saw elephant guardians. 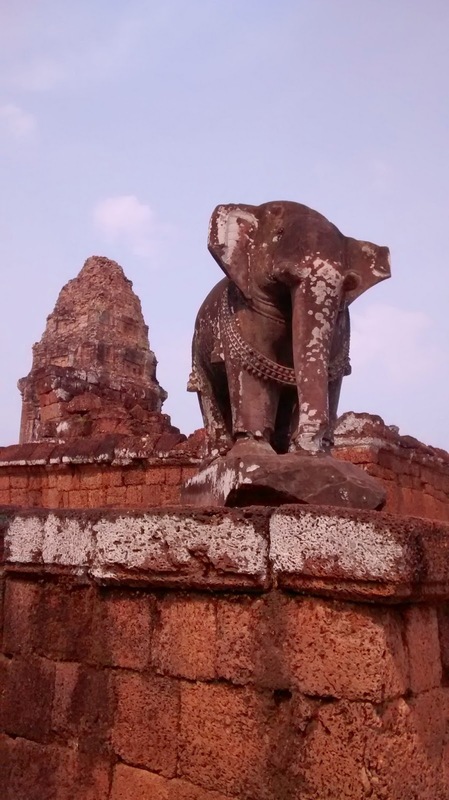 Most temples have lions; Banteay Srei has monkey guardians! The central level of East Mabon has five towers, just like Angkor Wat. But these were made of brick and plaster, and the plaster seems to have flaked off, leaving exposed bricks full of round holes that look like bullet holes. These apparently used to be filled with plaster. East Mabon was another temple where we saw the guardian Gods of each direction represented on the pediments. 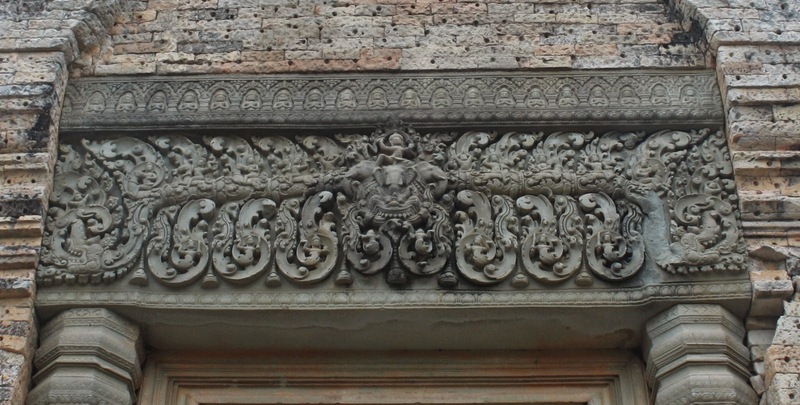 I thought they were less well done than at Banteay Srei, but at least we can see them close up. Below is Indra on his three-headed elephant. It drizzled while we were at East Mabon. Actually, the 'drizzle' was no more than a few drops that were still undecided about falling down, but for a brief while I had real hope of rain. Instead, we stood on the top-most enclosure and watched the lone dark cloud pass swiftly overhead towards the south-east. This is very interesting. Cambodia looks like a beautifully amazing country. Thank you for sharing, and what a great choice for letter E! Silvia: Thanks. Cambodia is very green and beautiful indeed!